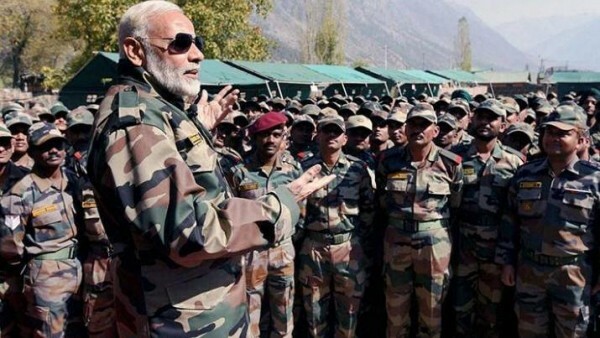 Modi uses the army for his hyper-nationalistic campaign. A controversy erupted over a letter written by a number of veterans to President Ram Nath Kovind alleging the use of the armed forces for political purposes, even as some of them said they had not given any consent for such a move. The letter, which carried the names of over 150 veterans, drew attention to "the unusual and completely unacceptable practice of political leaders taking credit for military operations like cross-border strikes, and even going so far as to claim the Armed Forces to be 'Modiji ki Sena'." The veterans have also objected to the use of pictures of Indian Air Force Wing Commander Abhinandan Varthaman — who was captured by Pakistan and then released — in posters, along with the image of soldiers, in election hoardings and campaign. In a letter dated April 11, the veterans urged the President to take “all necessary steps to urgently direct all political parties that they must forthwith desist from using the military, military uniforms or symbols, and any actions by military formations or personnel, for political purposes or to further their political agendas”. Air Chief Marshal N.C. Suri and General S.F. Rodrigues said they were not among the signatories. The two former service chiefs are among top-ranking defence officers who have denied signing this letter written to the President against the “politicisation” of the armed forces in the ongoing elections. Defence Minister Nirmala Sitharaman said that Suri and Rodrigues have said that they have not given their consent to this. “It is very worrying that if people are writing fake letters and allegations are being levelled by vested groups. It is highly condemnable. It is happening at the time of elections,” Sitharaman said. Former IAF chief Suri, one of the eight former chiefs of armed forces on the list of signatories, said he has contended that armed forces should remain apolitical, but said his consent wasn’t sought for the letter. “This is not Admiral Ramdas’ letter and it has been done by some Major Chaudhary. He has written this and it was coming on WhatsApp and emails. To put an end to it, I wrote that armed forces are apolitical and support the politically elected government. And no, my consent has not been taken for any such letter. I don’t agree with whatever has been written in that letter. We have been misquoted,” Suri said. “I don’t know what it is all about. All my life, we’ve been apolitical. After 42 years as an officer, it’s a little late to change. We in the services have always done what the government in power ordered us, we are an instrument of the state. Anyone can say anything and then sell it as fake news, I don’t know who this gentleman is who wrote this,” Rodrigues said. Defence Minister Nirmala Sitharaman called it a “fake letter” saying Air Chief Marshal N.C. Suri and Gen S.F. Rodrigues, who were listed among those signed, have both come out to say that their consent was not taken. She said that it was worrying that fake petitions were being signed. The Minister said the President’s House had not even received the petition. The petition had protested against the politicization of armed forces in the wake of comments like “Modiji ki Sena” made by Uttar Pradesh Chief Minister Yogi Adityanath. After the Balakot air strike, the opposition had accused the government of politicizing the armed forces and even Prime Minister Narendra Modi’s election speech is under the Election Commission’s scanner for having referred to the military action. In the petition dated April 11, the veterans urged the President to take “all necessary steps to urgently direct all political parties that they must forthwith desist from using the military, military uniforms or symbols, and any actions by military formations or personnel, for political purposes or to further their political agendas”. “We, therefore, appeal to you to ensure that the secular and a-political character of our Armed Forces is preserved,” the veterans appealed to the President.